A tire tank waterer. Photo by University of Missouri Extension. The ideal time to put a pipeline through a pond for a tire tank or concrete watering system is while the pond is being built or cleaned out. 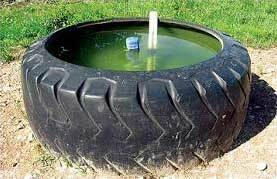 But what if you want a tire tank below the pond and it’s already full of water? On June 4, 2016, Frontier Extension District has scheduled a demonstration site in Anderson County where Herschel George, water quality specialist, will put a pipeline through the dam of an existing 10 acre pond. Registration will begin at 8:30 a.m. and excavation will start at 9:00 a.m. We will conclude by 2:00 p.m. or earlier. The demonstration site is located 1 1/2 miles east of Kincaid at the intersection of state Highway 31 and Vermont, then south about 100 yards. The demonstration will include cutting through the pond dam, installing a water line through the dam (while not losing more than 100 gallons of water), putting in a shut off valve, running the line to a tire water tank and plumbing the tank. Research shows livestock prefer water facilities in the following order: tank or trough, pond, pool in stream, and flowing point on stream. Palatability and water temperature have been shown to greatly influence water consumption. Animals, like people, drink more when better water is available. Feed consumption is also related to water consumption. A tire tank or concrete tank, instead of livestock drinking from a pond, provides cooler, cleaner, fresher water and eliminates livestock damage to the pond edges, spillway, and dam. Wading in the drinking source creates muddy, bacteria-contaminated water. Fencing the pond and dam prevents animals from standing in the water, thereby lengthening the life of the pond. The fence should be designed and built to exclude all livestock. Thirty feet of grass buffer inside the fence protects the pond by filtering runoff and capturing most of the silt and contaminants before they reach the pond. Plans are to work through lunch, so bring a sandwich if you wish. If weather is a concern, or for more information, call Herschel George at 913-294-6021 or Rod Schaub at 785-828-4438.